When you have kids, you NEED a car. Having a car is probably second to only the washing machine as a possession that I would find it very hard to live without. However, it can be very confusing to decide how to go about getting a car. Should you get a used car? New car? Buy it? Lease it? Take the one with a rebate or lower interest? And unfortunately, you can’t ask a dealer because they will tell you that you should do what will make them the most money at that time. All “free gas for a year!” promotions and “0%!!! !” have a profit margin built in to them so don’t be fooled that you are getting a “deal”. 1) What kind of monthly payment can you afford? This should include the cost of the car AND the insurance (and insurance will be different depending on the type of car you get). 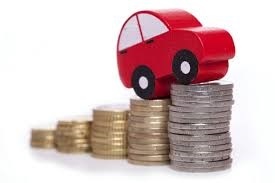 Most financial experts would recommend that a car should be paid off within 3 years, so it is a good bench mark to use when considering the price range of the car. Step 3 – Next, divide that amount by 12 to see what your monthly cost would be. Add the insurance premium you would expect to pay for that car. Step 4 – Compare that to what you have allocated for your monthly car budget or stick it into the budget template and see what percentage of your overall budget it comes out to be. If the amount is higher, you most likely CANNOT AFFORD IT. Pick a cheaper car. From a responsible financial standpoint, the general consensus is that buying is always a better choice than leasing in the long-run. The reason is that buying results in ownership and presumably you will have an asset at a time when you aren’t making a payment. If the average life of a car is 10 years and you pay your car off in 3, you will have 7 years of no car payments. That could be a HUGE savings, even if you factor in the higher maintenance costs associated with an older car. Leasing means you will always have a car payment and nothing to show for it. Insurance is usually higher on a leased car, most leases still require a down payment (which you will have to come up with every time you get a new lease), your payment has an amount for depreciation worked into the monthly cost AND when you return the car you can be hit with extra fees for going over your allowed mileage and “above normal” wear and tear on the car (and “above normal” is determined by the dealer). I had a friend who had to pay a $2,000 fee for above normal wear and tear on a leased Audi (apparently the rims were more scratched up then they should have been). I think leasing makes sense if you relocate often and moving a car around would be inefficient/expensive. Also, leasing can sometimes be a better choice for those who are strapped for cash because monthly payments are often lower because they are often done over a longer-term. You also don’t have to worry about reselling it later on since the dealer takes that risk. Lastly, I guess if you are the type of person who always wants to have a new car than leasing is a good option but to me its in the same category as leasing a fridge or a TV and I think is just silly when you have kids. 3. Should you buy/lease the car with the rebate or the low-interest? Again, its all about the math and the best choice is the one that has the lowest overall cost at the end of the loan. I recently read that zero interest, or a number close to zero, is “the crack cocaine of consumer financing, and automaker ads stress this to make the purchase of vehicles guilt-free”. And I know plenty of smart people who totally fell for this. “This car is ONLY 0.9% interest!” and then justify spending MORE money on a car because they think they are getting a better “deal”. For example, say you are comparing two cars, each with a base price of $30,000. 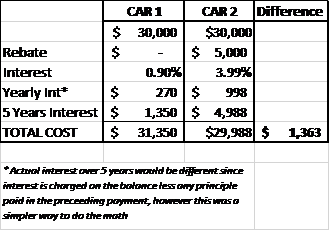 Car 1 has a 0.9% financing rate for 5 years and Car 2 has a $5,000 rebate at 3.99% for 5 years – what is the better deal? In this case, the car with the higher interest rate (but with a rebate) is actually the better deal. But if you are buying and find that the two deals result in the same overall cost —say, choosing between a large rebate with a higher interest or no rebate but with a zero percent interest for five years—taking the rebate is the better strategy.This is because you get the savings right away via discount on the purchase price, whereas the interest savings on the 0% (or whatever the low interest rate is) are earned over the life of the loan. If the car is written off early or you want to sell it before financing is paid off, the customer with the rebate will be ahead. 4. Should I buy new or used? This one isn’t as obvious. I’ve personally done both. My current car was purchased new. The one before was used. Yes, used cars are often much cheaper (and have cheaper insurance) and if you get a good one, can save your family a lot of money. But they are also cheaper the older they are and older cars need more repairs AND you can never be sure that they were well maintained before you bought it. As a parent, this was very important to me – I wanted to make sure that the car I was putting my kids into was safe above all else. The reason we ended up selling our used car (that we bought when it was 3 years old) was because we no longer felt it was safe (lots of trouble with the brakes and the engine spontaneously turning off) and the extended warranty that we had purchased (thank goodness, because a lot of the repairs would have been extremely expensive) was about to expire. I was disappointed because I actually really liked the car overall. The reason we decided to buy new was that we just didn’t want to deal with that worry again and figured that the premium of driving a new car off the lot (that we would ensure was properly maintained) was worth it. Can you afford to be a stay-at-home mom? 5 steps to see if you can.